The Fw 189 A-1 Uhu is a gift Rank I German bomber with a battle rating of 1.7. 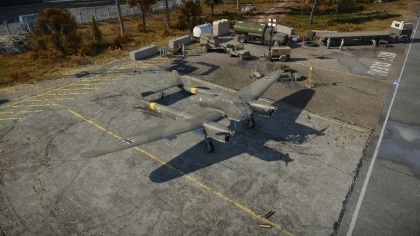 It was introduced during Update 1.61 "Road to Glory" in the "Operation S.U.M.M.E.R." event of 2016. In most cases, you'll be using the eagle owl as a heavy fighter. Fortunately the plane can be flown like any other turn fighter in-game. However, this plane requires a few different flight techniques. The Fw 189 is best described as a multi-purpose heavy fighter. And when I say heavy-fighter, take it with a grain of salt. 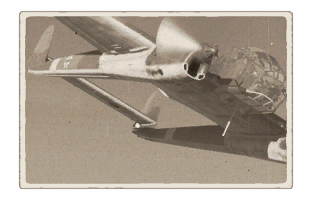 Thanks to the heavy airframe, large wingspan, and large elevator, the Fw 189 is an incredibly maneuverable plane, rivaling that of early rank Spitfires and Hurricanes. Thus, in war thunder, the Fw 189 fulfills the roles of a light bomber, ground attacker, heavy fighter, and reconnaissance in EC/ combined battles. As a premium aircraft grinding for upgrades is not necessary. Only the "Mark of excellence" can be unlocked. It will grant the ability to place and show four decals without having a premium account. Around 1937, the German Air Ministry wanted a short-ranged, three-seated reconnaissance plane with great visibility act as an army co-operation aircraft. Two aircraft manufacturers wanted the contract: Arado and Focke-Wulf (Blohm & Voss participated but it was a private venture). The Fw 189 prototype had an unusual twin-boom twin engine design so that there will be no engine blocking the front of the cockpit which offered maximum visibility and good speed. It was powered by two Argus As 410 engines and utilized a heavily glazed "stepless" cockpit. Which is all glass and supporting frame to block vision, which is similar to cockpits found on late-war German bombers. It was extremely successful not only because it was fast, but also because it was an extremely maneuverable aircraft. One trick utilized when a fighter came to intercept it was to start turning in a tight circle, in which the pursuing fighter could not match. Later in the war, this aircraft was retrofitted for a variety of tasks which included light ground attack and a night fighter variant. The Fw 189 Uhu was first available in Operation S.U.M.M.E.R. of 2016 that lasted from 22 July to 22 August. It was unlocked after obtaining 18 pilot Marks of Distinction. It was next available in the 2017-18 Special Festive Quest from 22 December 2017 until 22 January 2018. It requires 10 Christmas toys and also 500,000 Christmas lights accumulated between all players. This page was last edited on 18 January 2019, at 04:21.